Grab a chair and $10 (only $5 if you are a student) and come for some fun! 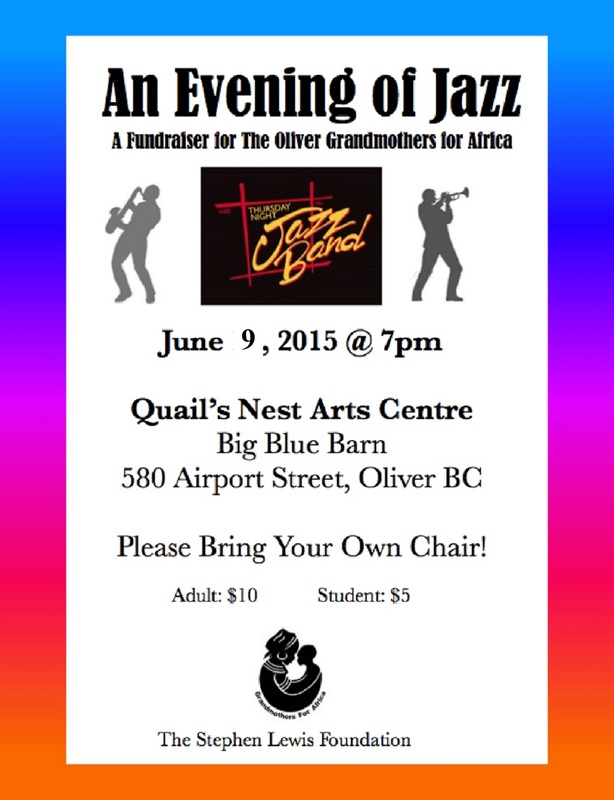 Thursday, June 9th at 7 pm Oliver’s Grandmothers for Africa are presenting the Thursday Night Jazz Band at the Quail’s Nest on Airport Road. Last year these amazing musicians filled the air with toe tapping, body swaying music. The audience, camped out on chairs they carried to the venue, spilled out the big doors into the warmth of a perfect Spring night. We should be so lucky again!! It was a happy mellow mood. Walls were hung with African fabrics. Host grandmothers wearing their distinctive lemon yellow shirts with the black logo of mother and child plastered on front welcomed the crowd. The idea of the Thursday Night Jazz Band is unique, brilliant and quite different from a formal concert. Talented and generous, a substantial group of jazz musicians from the South Okanagan get together in various combinations to perform. They have to practice and most have day jobs. So Thursday nights, informal and fun, are practice time and why not practice in front of an audience and help local charities raise money for worthwhile causes? On June 9th the cause is the Stephen Lewis Foundation programs in Africa to help African grandmothers raise grandkids orphaned by the AIDS pandemic. The history of AIDS in Africa chronicles hardship and painful losses but it also is the story of indomitable grandmothers. They put their grandchildren through school, harvest crops, create local savings and loan groups, teach others about HIV prevention and treatment, and participate in innovative income-generating programmes. They form support groups and deliver comfort and hope through home-based care. When you join us June 9th you will be part of a win/win musical evening with a variety of big band jazz pieces and some incredible improvisations. Come with your friends for some fine entertainment knowing that by attending you are helping children in Africa survive and thrive.